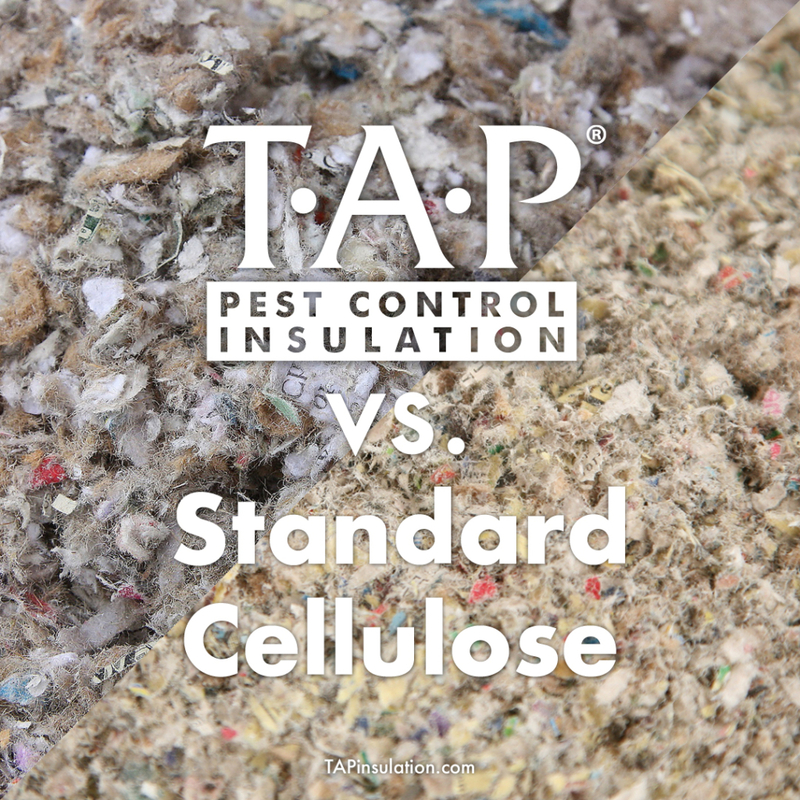 Many people try to compare TAP vs. Standard Cellulose. Just how different are they? Produced to the specifications detailed in the TAP® Pest Control Insulation Engineering Book, TAP® Pest Control Insulation is a 30 lb. bag of pesticide falling under the regulatory control of the U.S. Environmental Protection Agency (EPA) and state pesticide regulatory agencies. As an EPA-registered pesticide, TAP® Pest Control Insulation is backed by scientific efficacy studies documenting its ability to control insects and protect homes. And yes, it is also a cellulose insulation. Other insulation may be treated by an EPA-registered chemical to protect the insulation itself from damage, but claims that it will protect homes from pests and the structure from damage is false and misleading consumers and can lead to fines and business closure based on state and federal statutes. Some salespeople will falsely claim that their product “is the same.” While it is true that most cellulose insulation contains some form of borates to provide fungi resistance and to act as a fire retardant, these products have not been submitted and vetted by the arduous and often costly processes required of a federally registered pesticide. Therefore, such marketing claims by a sales representative can and have subjected manufacturers and their sales force to legal action by EPA including cease and desist orders, as well as significant fines. Claiming that any borate-treated cellulose resists insects is also false. TAP® Pest Control Insulation is lethal to certain insects that come in contact with the insulation. Many companies claim that the boric acid in their product “resists” or “repels” insects. Scientific studies reveal that boric acid is undetectable to insects. Therefore, insects cannot be repelled from something that they cannot detect dispelling the false “repellency” claims. Individuals or companies that make such claims are uninformed about the scientific properties of boric acid. Without proper testing and registration, it is nearly impossible to know if the borates or borate derivatives in cellulose insulation will control insects. Therefore, only insulation materials that have earned an EPA label, such as TAP® Pest Control Insulation, can legally claim to kill insects. Simply pointing to an insecticide that is added to the insulation does not qualify or mean that the insulation now has pest controlling qualities. It’s just not that simple since dosage, active percentage, residual and presentation are all factors that impact its effectiveness. The EPA’s region offices, as well as all state pesticide regulatory agencies, closely regulate any product that claims to have an effect on insects or other pests. Because TAP® Pest Control Insulation is a substance that controls pests, it must be registered with the U.S. EPA as well as each individual state in which it is sold. These entities mandate that label instructions be followed as well as license requirements for commercial installation. Most states require TAP® Pest Control Insulation to be sold and installed by licensed pest management professionals. Products that make false claims (including verbally), such as “resists insects” or claiming it is the “same product” without proper registration, can be met with serious fines and loss of license. We are aware of a recent instance of 4 branches of a pest control company being closed by state regulators due to making “same as TAP” claims for a standard insulation. We are also aware that $4,000 to $5,000 in fines have been awarded to companies in other states for making these types of false claims. Don’t expose yourself or your company to such fines or make claims that cannot be substantiated. If you have additional questions, please feel free to Contact Us.